The European Food Safety Authority (EFSA) has recently approved Biova’s egg membrane ingredient as a Novel Food. “Under EU regulations, any food that was not consumed “significantly” prior to May 1997 is considered a novel food…” according to EFSA. Biova’s egg membrane is the first of its kind to receive EU Novel Foods approval. Stauber has been appointed the exclusive US distributor for Biova’s innovative water-soluble eggshell membrane ingredients in the Nutraceutical, Functional Foods & Beverages and Pet industries. January 2018 – Johnston, Iowa & Fullerton, CA, USA. Supplement brand owners and formulators who are looking for expanded delivery options for their joint health and beauty from within products can now ask their Stauber Sales Contact about Biova’s water-soluble eggshell membrane ingredients. Biova’s ingredients are for joint health in humans (BiovaFlex®) & pets (BiovaPlex®), as well as for beauty-inside-out (BiovaBIO™). 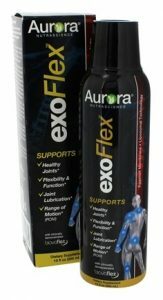 October, 2017 – Biova, LLC., would like to congratulate Aurora NutraScience, and their US exclusive distribution partner Vida Lifescience on winning the 6th annual SupplySide West CPG Editor’s Choice Award in the Joint Health Supplement category, for their product exoFlex™. Aurora and Vida have been bringing liposomal products, which positively impact people’s health, to market for several years. August 17, 2017 – Biova, LLC., the leader in water-soluble egg membrane ingredients, has added Amanda Orloske as Director of Marketing to the management team. Amanda has over 10 years’ experience in Marketing and Sales in the Nutritional Industry with Unigen, Inc. an ingredient supplier in the dietary supplement and cosmetic segments. August 2, 2017 – Biova, LLC announced today that they have joined the Council for Responsible Nutrition (CRN), the leading trade association representing the dietary supplement and functional food industry. CRN’s member base encompasses more than 150 companies—both finished product manufacturers, as well as suppliers across the industry. This product is not intended to diagnose, treat, cure or prevent any disease.